Another argument for Open Borders: It is good for the quality for football! There is no doubt that I strongly favour a policy of removing restrictions on immigrations. Nathan Smith in his recent guest post on my blog showed that a policy of global Open Borders would significantly boost global GDP. However, there might be even better arguments for Open Borders. My friend Ben Southwood, Head of Policy at the Adam Smith Institute, in a new paper argues that the “crackdown on foreign players hurts English football”. You might not buy Nathan’s arguments, but you should certainly buy Ben’s arguments for Open Borders in international football (to my American readers: Soccer). It is a very common view that “importing” foreign football players into the UK to play in the Premier League leads to less opportunity for English players to play for these teams. This means that English players get less high-level experience, and consequently aren’t as good as the players of Spain, France, Italy or Ger- man, who make up a larger fraction of the players playing in their home leagues. This, the argument runs, is an important factor in explaining the English national team’s perceived underperformance in international competitions. I review the literature and present novel data establishing a negative relationship between current performance (as measured by FIFA ranking) and the current amount of football played in a league by native players (across Spain, England, Germany and Italy). Further, I find no relationship between minutes played by English players in the Premier League five or ten years ago and current performance. Finally, I find strong evidence that a league’s overall strength (as measured by its UEFA coefficient) is predicted by the current amount of foreigners playing in it. To restrict foreign players would not directly benefit the English national team, but it would risk substantially curtailing the overall quality of the world’s most popular football league. PS in my favourite team FC Copenhagen there are very few Danish players and the best “Danish” players have immigrant background. Thank god for immigration and free trade in footballers! 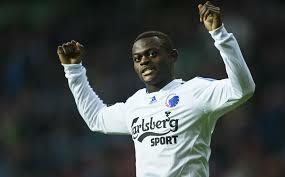 PPS this is my son’s favourite (now former) FC Copenhagen player Igor Vetokele.